J.M. Barrie, author of Peter Pan, was a regular visitor to this lovely little village on the Cotswold Way. He loved Stanway so much he donated the thatched cricket pavilion that rests on mushroom-shaped stones in the centre of what is little more than a cluster of houses dominated by the fascinating Jacobean Stanway House. The house was given to Tewkesbury Abbey by Mercian leaders Odo and Dodo in 715. Supporting four monks it was the only remote property owned by the Abbey until the 12th century. The Abbey held onto the property for eight hundred years until it passed into the hands of the Tracy family. who are almost unique in England for having owned land since before the Norman Conquest. 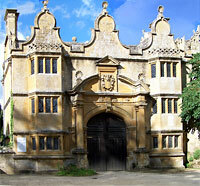 Richard Tracy, who led the dissolution of Hailes Abbey, took over the lease for Stanway House from Abbot Segar in 1533. In time he was able to buy the freehold, which he left to his son Paul, who was made a Baronet in 1611. Paul began to rebuild the house, incorporating some of the early Tudor features. On his death it passed to his son, Sir Richard Tracy, who added the gatehouse in 1630. It was Paul's grandson, Sir Humphrey Tracy, who finally completed the building in 1640. Sir Humphrey was a Royalist supporter and had to pay heavy fines to avoid the property being confiscated after the Civil War. The Tracy line continued until 1817 when the house passed to Francis Charteris, 8th Earl of Wemyss and 4th Earl of March. Francis' mother was the great granddaughter of Ferdinando Tracy and the present resident, Lord Neidpath, is a direct descendent of Francis. Thus the house can claim to have been in the same family for over 450 years. Now open to the public, Stanway house is described in glowing terms in Fodor's Great Britain Guidebook (1998). 'As perfect and pretty a Cotswold Manor House as anyone is likely to see.' It is built in delicious warm stone known as Guiting Yellow and has a stone roof. The oldest part of the house is the gabled west front which includes the great hall, where manorial courts were held until around 1800. It is a remarkably light room with an enormous full height bay window and a raised dais still in place at one end. Just off the hall is the drawing room, which contains a pair of antique Chippendale day beds from around 1760. Most of the furniture in the house has been there since it was made and there are plenty of fine specimens including rare paintings, two Broadwood pianos, a working Charles I shuffleboard table and a Chippendale exercise chair. Perhaps even more spectacular than the house are the gardens. Lord Neidpath has implemented a restoration programme during the last decade and can now claim to have one of the finest water gardens in England. They were probably created in the 1720s for John Tracy by the eminent garden designer, Charles Bridgeman, who was gardener to Lord Cobham at Stowe before going on to become the Royal Gardener in 1727. The canal at Stanway is a typical feature of Bridgman's design, an arresting sheet of water situated oddly on a terrace 25 feet above the house. The canal now houses the largest gravity-fed fountain on earth. This single-jet fountain has a two inch bronze nozzle and is driven from a 100,000 gallon reservoir 580 feet above the canal, via a 12 inch diameter medium-density polyethylene pipe 2km long. When all the valves are open it can reach a height of 300 ft. The gardens also features fine specimen trees, broad terraced lawns, lavish herbaceous borders and a 14th century medieval tithe barn, with a stone roof supported by massive basecruck timbers. The tithe barn is now used for events and as a theatre. Other interesting features of the house and gardens are a brewery, a dog's cemetery and a fantastic-looking pyramid erected in honour of John Tracy, who died there in 1735.